university, Bundoora Victoria, Australia 3083} won honorable mention in the microcomputer graphics category at the Computer Graphics Contest held at the Eighth Biennial Conference on Chemical Education last summer for his figure entitled "Aureomycin".. This figure was produced using a Sinclair "Spectrum" 48k microcomputer with a ZX printer. A photograph of the figure was taken and enlarged. The program is about 210 lines in length written in BASIC with an embedded assembly language routine. Dr. Davis indicates the program is general and allows organic chemist to draw fairly complex structures quickly. The program will draw multiple ring compounds of different size and orientation containing heteroatoms, different types and angles of bonds: and substituent groups with extra graphic symbols. The printer output is directly useable in research papers and theses. The metal-coated paper used in the ZX printer photocopies very well. Dr. Davis has used enlarged negative photos of the printer output in poster sessions in Australia and New Zealand. 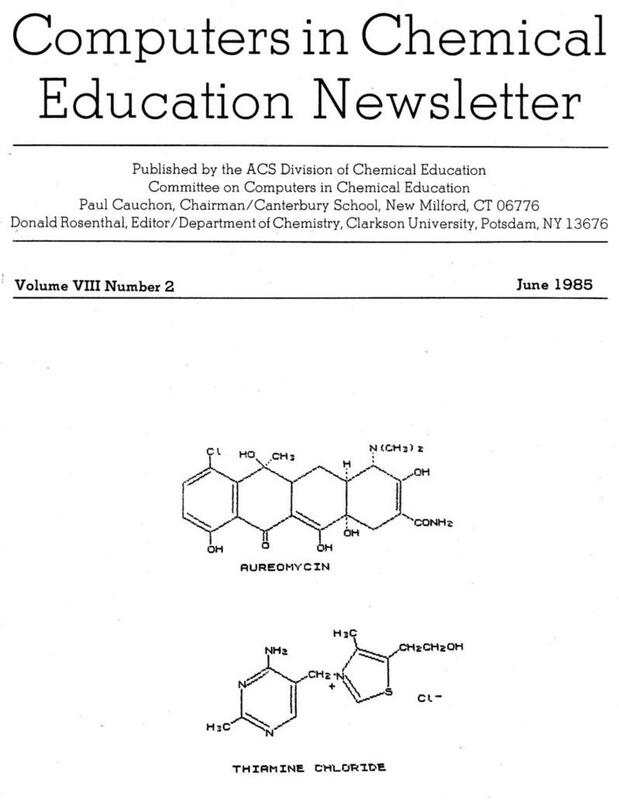 "INTERFACING" continues to be one of the hottest topics for discussions concerning the roles of computers in chemical education. With many chemistry teachers as yet only slightly less comfortable with the concept than are many of our students with the mole concept, there is more than enough interest to draw a crowd to any presentation that deals with linking microcomputers to lab instruments. For example, the first of the Potsdam workshops to be oversubscribed was you guessed ,it- section D, "Interfacing". Numerous pending proposals seeking NSF support under the "Teacher Enhancement" program list familiarization with·interfacing as their primary objective. Not withstanding the position taken by one speaker at the Computer Secretariat conducted during the Miami ACS meeting, a theoretical chemist who "accused" us of " ... perverting the proper role of computers by using them to deliver CAI instead of solving Schrodinger equations", it appears that what we are doing for our students will be significantly enhanced once interfacing becomes an everyday activity in our labs and classrooms. Before this can happen, there is a real need to identify valid applications that use interfacing for purposes beyond illustrating the technique of interfacing. Learning ABOUT computers as data collection devices is certainly a valid course objective, as is learning to use any laboratory instrument, but what seems even more important is establishing new objectives that become possible BECAUSE of this technique. Progress is being made. Ken Ratzlaff offered some ideas in the third part of his excellent series, "Scientific Applications of the Apple Game Port" in this Newsletter (Dec. '84). At the Miami meeting, John Moore outlined two intriguing experiments under development using the SERAPHIM photocell and thermistor-based kits exploring reaction rates and equilibrium. But we are a long way from having a truly satisfactory answer for the chemistry teacher who asks "Nm-t that I've built it, what do I do with it?" At one session in r.1iami, the speaker displayed his heart rate on the screen of an Apple with an LED and a phototransitor. He went on to say "You can do lots of interesting experiments with this device!" Exactly what some of those things are was offered in the form of a challenge to our imagination rather than an already existing repertoire of validated applications. But I am confident that there are ·a number of people reading this Newsletter who have already recognized and risen to the challenge and are doing some interesting chemistry with a "bloctronic" or a thermistor. How about putting your experiences on paper and submitting them to this Newsletter. Let's hear about how you've connected your computer to the "real world" of live data and what the impact has been on your courses. It has often been said that computers will change not only how we teach but what we teach, as well. I'm convinced that the ability to simultaneously collect, process and display data will enable us to do exciting things we never thought of as possible, in fact never thought of at all. This Newsletter is one forum for those of you who are already doing them. Two C. C. C. E. National workshops have been planned for this summer. workshop - East will be held at Clarkson University in Potsdam, NY from July 28 to August 1. workshop - west will be held at Truckee Meadows Community College in Sparks, NV from August 11 to 14. An announcement of the workshops - West appears elsewhere in this issue. The eastern workshops currently have over 100 registrants and several of the workshops are rapidly becoming filled. The Microcomputer Interfacing workshop has been filled for several months. If you're interested in interfacing apply to the western workshops. to hear from anyone interested in participating in the symposium. For a variety of reasons it will not be possible to use computers, monitors or video projectors. Only overhead projectors and slide projectors will be available. Anyone having suggestions for programs at future National Meetings (fall 1986 - Anaheim, CA and beyond) should contact Paul Cauchon. An article by Tim Eckert describing a short Basic program or subroutine be used to automatically scale the axes in plotting data is found in this issue. routine requires less than 20 lines of code. If you have a short routine which is general interest, please send it to me for publication in a future issue of this Newsletter.